The integral hitch provides excellent maneuverability for tight turns on shorter headlands. The hitch makes it easy to move in and out of buildings. It is compatible for tractors with Category 2 or Category 3N or 3, 3-point hitches. The frame is available in 127-mm x 178-mm (5-in. x 7-in.) and 178-mm x 178-mm (7-in. x 7-in.) sizes. 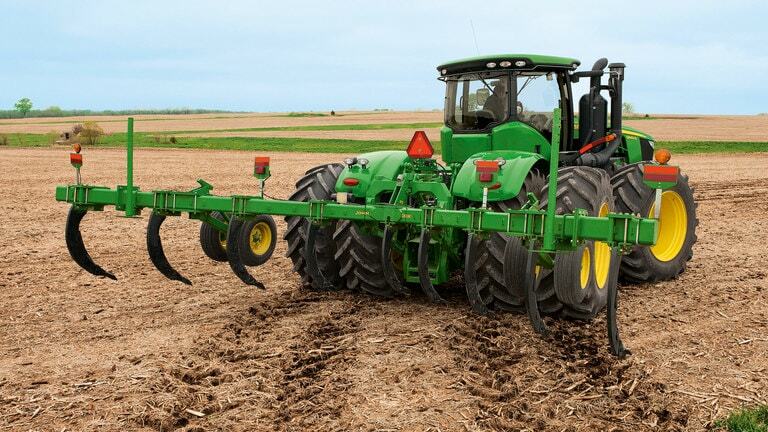 Rippled coulter blades cut through surface residue such as cornstalks, wheat stubble, or other heavy crops to help reduce plugging. The ripple on the blade bites into the soil to promote turning the blade in wet and/or firm soil, as well as lighter, drier soils. Cushion or shear-bolt designs are available. Automatically returns the coulter to the operating position once the obstruction is passed. Saves time by eliminating the need to stop and replace shear bolts. Unique rosette bracket used to adjust the coulter depth. Simply loosen one bolt and swing the coulter up or down to the desired height. Standard does not move, so maximum trash clearance is retained. Protector bolt (arrow) will yield if the obstruction height exceeds the deflection range of the coulter, thus preventing serious damage to the coulter. *NOTE: When ripping in fields with obstructions, it is necessary to restrict the working depth in order to give the coulter space to travel over obstructions. Without coulters, the maximum working depth is 584 mm (23 in.) for shear-bolt standard and 559 mm (22 in.) for safety-trip and spring-reset standards. Provides economical alternative for protecting coulters in fields with few obstructions. The 915 V-Ripper has excellent residue-handling capability in primary tillage at all residue levels. At higher levels, coulters may be required to minimize plugging. Typical percentage of residue cover remaining from the 915 are listed as follows. NOTE: The percentage do not take into account variables such as the condition of the residue, speed, and soil type. **Fragile residue includes crops like soybeans, edible beans, peas, wheat, (under 45 bu), sunflower, peanuts, cotton. 38 mm (1.5 in.) below the bottom of the compaction layer. The probe allows obtaining the maximum amount of soil fracturing from the entire family of John Deere ripper points. Marked in 51-mm (2-in.) increments from 254 mm to 559 mm (10 in. to 22 in. ), the probe provides accurate feedback of compaction layer depth. It is stored on the mainframe of the ripper for convenient access. The operator's manual explains the proper use of the soil probe. Shear-bolt 35.5-in. Cushion-trip 37.5-in. Safety-trip and spring-reset 39.7-in. Option 1 8, 4 ft, in. Option 2 10, 5 ft, in. Option 3 12, 6 ft, in. Option 4 11, 8 ft, in. Option 5 14, 7 ft, in. Option 6 17, 6 ft, in. Option 8 18, 9 ft, in. Option 9 22, 6 ft, in. Option 10 18, 4 ft, in. Option 11 22, 11 ft, in. Option 12 21, 8 ft, in. Option 1 13, 9 ft, in. Option 2 13, 9 ft, in. Option 3 13, 9 ft, in. Option 4 17, 7 ft, in. Option 5 17, 7 ft, in. Option 6 17, 7 ft, in. Option 12 22, 8 ft, in. Maximum underframe clearance Shear-bolt 35.5-in. Cushion-trip 37.5-in. Safety-trip and spring-reset 39.7-in. Spacings 20, 25, 30 in.